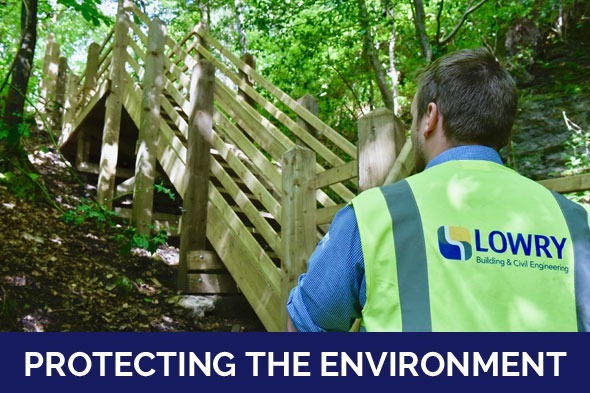 Lowry Building & Civil Engineering Ltd understand the importance of protecting the environment for this and future generations to come. To achieve this we operate an Environmental Management System which is third party accredited by NQA to ISO 14001:2004 standards. This system covers every aspect of our operations and ensures that we proactively establish project specific measures to reduce waste to landfill, recycle and reduce our carbon footprint. A key measure within the system is the Environmental Management Plan which we develop for every project. This comprehensive document is based on specific processes such as Environmental Impact Assessments and Site Waste Management Plans which are uniquely tailored to the location and scope of works being undertaken. The objective of these processes is to deliver the most efficient use of energy, reduce waste, recycle materials, use materials from sustainable sources and mitigate or eliminate all pollutants. We proactively achieve all of these aims through many innovative steps such as using the latest fuel efficient, low noise/low emission plant and equipment, reducing water usage on site through rainwater harvesting and only procuring materials with lower environmental impacts such as Forest Stewardship Council (FSC) Certified timber. We also work with local communities to provide employment opportunities either directly on site or by using local supply chain partners.